The Appalachian Theatre was built in 1938 by W. Ralph Winkler and A. E. Hamby based on a design by a Lenoir architect, Clarence P. Coffey. The theater first opened on November 14, 1938, and operated for nearly 70 years, until its closure in 2007. That's the quick version, anyway. But the Appalachian Theatre has a much more interesting and complex history, including a surprise raid by federal officers, a devastating fire caused by a popcorn machine, a progressive view on race relations, a long run of exploitation films, an even longer run as a dollar cinema featuring family fare, and a bankruptcy that almost led to the building's demise. An early advertisement for the first Appalachian Theatre during its Courthouse run, Watauga Democrat, August 10, 1922. Winkler and Hamby may have built the building that we know today as the Appalachian Theatre in 1938, but it was not the first cinema operation in Boone or even Watauga County. Film exhibition in Boone went back to at least March 7, 1905, when a traveling showman projected films in the second (1875) Courthouse in its final days as a working public building. Moving to the new 1905 Watauga County Courthouse, occasional picture shows by Jack Campbell and others followed until 1919, when Clarence Ellis and O. L. Coffey operated a more regular service under the “Appalachian Theater” moniker from July 1919 through the summer of 1922. "Theater" would have been a bit of an overstatement: the courtroom was certainly not an ideal film venue. We know that the silent films were accompanied by phonograph recordings—no doubt selected without much regard to enhancing the action on screen—and the projector and outdated films were of mediocre quality at best. Meanwhile, as early as 1918 in the nearby, bustling lumber town of Shulls Mills, about seven miles southwest of Boone, residents could take in a Saturday evening show of various serials, newsreels, and live acts at the American Theatre. Such entertainments were a novelty and a delight to mountain residents who had few other sources of public amusement. When Arthur Hamby and W. R. “Ralph” Winkler took over the courthouse cinema equipment in Boone in February 1923, with shows on Mondays, Thursdays, and Saturdays, they renamed the venue the Dixie Theatre and immediately began to pursue the construction of a permanent theater building. A new 410-seat theater—located in what is now the Professional Building on the south side of West King Street between Depot and Water Streets—opened as the Dixie Theatre in November 1924, but was renamed the Pastime Theatre in early 1925. Like many silent film theaters, the Pastime’s offerings included a mix of cinema and live entertainment. Initially, only a player piano was used for accompaniment, with an occasional vaudeville or popular music act featured in between films. Many wondered if the small town of Boone could support such an enterprise, but the Pastime flourished and changed with the rapidly evolving film industry, adding sound in 1929, as well as new seats and a more effective heating plant. By the mid-1930s, however, Hamby and Winkler realized that the Pastime could not be made into a truly modern showplace in its current facility. By late 1936, they were exploring plans for a new, larger, and more modern building, initially called the "new Pastime Theatre." In 1937, Hamby and Winkler purchased a house lot on the south side of West King Street owned by E. N. and Blanche K. Hahn. Here, working from plans by Clarence P. Coffey of Lenoir (the same architect who designed Cove Creek School), Hamby and Winkler erected Boone’s newest movie house, which they in turn leased in September 1938, along with the Pastime, to a father and son team from Statesville, A. Fuller Sams and A. Fuller Sams, Jr., who operated a chain of theaters known as the Statesville Theatre Corporation. Hamby and Winkler provided most of the furnishings and equipment, most notably two brand new Kaplan projectors; a new Western Electric sound system; seating for 999 patrons; stage scenery, drops, and curtains; a marquee, complete with neon letters; and chairs for the office. 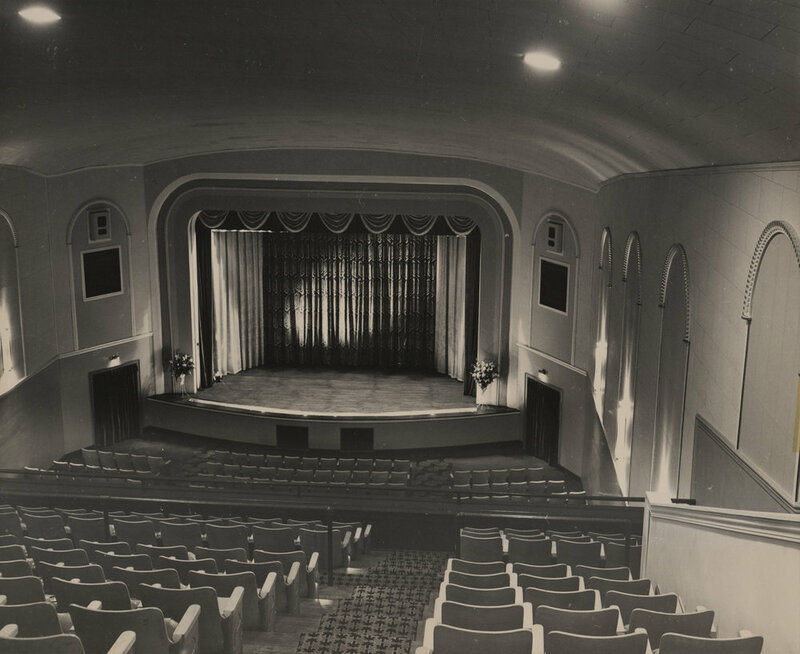 The lessees, meanwhile, installed the theater’s “new, first class carpets, draperies, [and] mezzanine and restroom furniture.” When finally opened in November 1938, the new theater took on the old Appalachian Theatre name, while the Pastime remained as Boone's B-movie house. With the construction of the Appalachian Theatre as a showplace in the heart of Boone’s small but bustling commercial district in 1938, Hamby and Winkler knew they had dramatically transformed the feel of Boone’s downtown. Located just a few blocks from Appalachian State Teacher's College (now Appalachian State University), business was excellent. 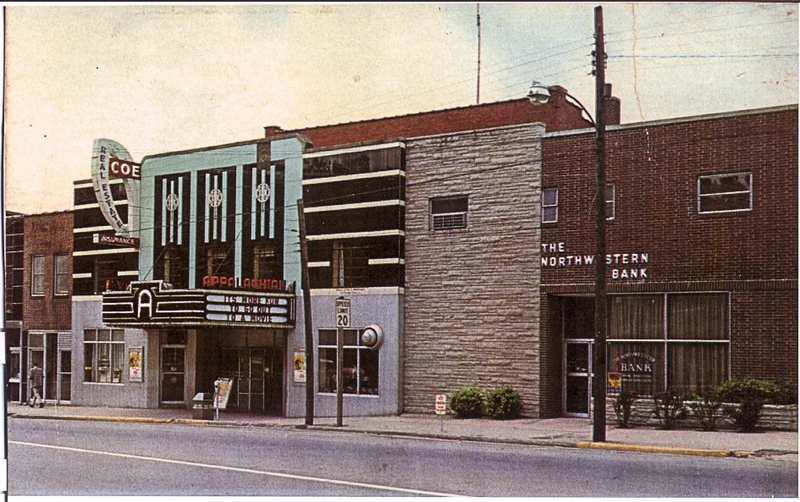 The two-story movie house was likely the first Art Deco building constructed in Watauga County, sealing its reputation as a stylish venue in a town whose architecture offered little variation. Its original front façade was brick covered almost entirely with decorative, structural glass tiles (made of Vitrolite or Carrara Glass) in black, mint green, and white, arranged in a geometric pattern leading to a prominent, parapeted, ziggurat motif above the projecting marquee. The marquee overhang was adorned with aluminum trim, porcelain-enameled metal, and red, yellow, and white neon lighting. Recessed from the street beneath the marquee overhang was a small box office decorated in a chevron pattern. Entry doors were located well behind each side of the box office, with an ornate entrance floor in a sunburst pattern of tan, mint green, and white terrazzo leading to the lobby doors. When the Appalachian opened on November 14, 1938, its premiere screening was Breaking the Ice, a film starring Bobby Breen and Irene Dare. The premiere bill also included a newsreel and a Disney featurette, Brave Little Tailor. Admission was tiered, at ten or twenty cents for the matinee and ten or twenty-five cents for the evening showing. Local tradition holds that Hamby and Winkler selected “997 spring-edge upholstered seats” to maximize revenue while avoiding a tax on venues with more than a thousand seats. At least two of the seats were known colloquially as “fat seats,” allowing two individuals to share a single seat. But building revenue was not limited to just its theater operations. Ever the efficient entrepreneur, W. R. Winkler built his showcase to house other tenants as well, including the Appalachian Sandwich Shop (sometimes known interchangeably as the Appalachian Soda Shop, and managed by John L. Yount) on the west side of its first floor façade; the Home Electric Company (J. S. Tilley, manager) on the east side of its first floor façade; and the Lillian Mae Beauty Shop (Lillian Mae Reichert, Claire Pittman, and Blanche Wooten as operators) located behind the east stairway entrance to the second floor of the building. This east staircase led to yet another group of tenants on the second floor, including a dentist and an optometrist. A separate residential apartment was also available to tenants on the second floor. The auditorium of the Appalachian Theatre in November 1938, as seen from the stage. Image courtesy of the Sams Family. Patrons line up at the Appalachian Theatre, February 19, 1948. Image courtesy of the Sams Family. In its first two decades of operation, the Appalachian Theatre was a bustling place for films, even as a third-run theater that often did not show films until months after their release in urban areas. The major Hollywood blockbusters played there, including Gone with the Wind (released in 1939, premiered in Boone June 12, 1940), Citizen Kane (October 6, 1941), Casablanca (May 4, 1943), and It's a Wonderful Life (April 17, 1947). Run-of-the-mill films like westerns and gangster movies padded out the six-day-a-week program, which could include as many as seven different feature films shown each week by the early 1950s. Saturday performances in the early 1950s were highlighted by a western during the afternoon matinee—often a big draw for local kids—followed by a different film at night. Cartoons, newsreels, and travel and sports films set up the main features, as did multi-chapter serials. Until the addition of a Cinemascope screen in 1954, numerous live, traveling novelty acts, Vaudeville shows, and musical groups—including Uncle Dave Macon, Bill Monroe and His Blue Grass Boys, the Renfro Valley Folks, Minnie Pearl, Pee Wee King, Lester Flatt and Earl Scruggs, Lonzo and Oscar, and local legend Doc Watson—also made appearances on Appalachian’s stage, as did the occasional local stage play, spook show, talent show, minstrel show, or beauty pageant. While the 1940 Boone Flood, which destroyed the railroad tracks leading into Boone from Tennessee, suppressed the flow of traveling acts to the Appalachian, a handful of road shows continued each year into the 1950s. Many folks have wondered about Doc Watson’s connection to the theater, given that he was busking on the streets of Boone throughout the 1940s and 1950s, and the theater was known to feature many local musicians on its stage during that period. Indeed, Doc Watson was advertised in September 1943 as appearing on a bill for a “Hillbilly Jamboree, which was also to be carried “on the air” live from the Appalachian Theatre via a station listed as WDRS. By 1943, the former Home Electric Service space in the theater building was occupied by a new tenant: the Dacus Radio Service, operated by Kermit Irvin Dacus. Unfortunately, Dacus’s radio station was a bootleg outfit that he operated without the proper FCC license. In October 1943, according to the Greensboro Daily News, federal agents busted Dacus for his operation and charged him with violating the Federal Communications Act of 1934. Tipped off by stations in Norfolk, VA, and Chicago, IL, whose signals were disrupted by WDRS, the FCC agent described seeing “a radio station operating at the Dacus radio shop with one person changing records and others sitting in the studio with a musical instrument.” This federal intervention appears to have ended the live radio broadcasts from the Appalachian stage. By 1950, the Sams family was operating the theater under the name Appalachian Amusement Company, a division of their Statesville Theatre Corporation. That year, the Appalachian Theatre experienced a new round of drama in the form of a devastating fire on Saturday, January 21, 1950. Ignited by a defective popcorn maker that was left unattended by a teenaged theater worker named Bill Jones, the fire began just as the afternoon matinee—Gene Autry’s Riders of the Whistling Pines—was underway. As the theater manager, Jay Beach, stood on stage and asked the audience to leave calmly, flames burst out through the ventilation ducts and raced along the west wall of the theater, prompting something resembling a stampede. When the crowd of patrons, many of them children, reached the front doors of the theater, a large concussion—what one witness called “a hot wave”—swept through the theater. While no one was killed and what few injuries there were proved minor, the damage to the auditorium interior was catastrophic, in large part because the roof of the auditorium collapsed into the building. Details about the fire, its cause, and the related damages survive to this day because W. R. Winkler brought suit against Appalachian Amusement Company for negligence. While trial testimony from most local lawsuits in Watauga County during this period does not survive, official witness accounts for this case were sent to Raleigh and thus preserved when the local court’s verdict was appealed to the North Carolina Supreme Court. That testimony tells a story of poor maintenance, lax fire safety measures, and teenage distraction all contributing to the memorable conflagration. During the period of reconstruction (which lasted from January to May 1950), the Sky-Vu, Boone's first drive-in movie theater, opened. The Pastime enjoyed a final burst of glory, too, as the Statesville Theatre Corporation shifted the scheduled Appalachian Theatre shows to the Pastime’s old screen. Even the seasonal Yonahlossee Theatre in Blowing Rock, usually open only from May to October, was called into action in January 1950. At the Appalachian Theatre, meanwhile, W. R. Winkler was personally supervising the renovation work, to the point of selecting which fire-damaged joists were salvageable and which required replacement. Many of these fire-singed joists are still visible within the theater (although these will be replaced when the inside of the theater is renovated). To cope with the damages to the upper walls and a collapsed roof, and to save money on heating in the renovated theater, Winkler installed a barrel roof to replace the tiered roof of the original. He then hired Harris F. Ragsdale, an interior designer from Atlanta, to complete renovations to the décor of the Appalachian. New Art Deco sconces, which still survive, replaced the old fixtures. Winkler also expanded the stage, giving it a curved apron that jutted out from its original flat edge, while the Statesville Theatre Corporation supplied a new Starke Cycloramic Custom Screen, which allegedly offered a brighter and more consistent image because of the “satin smooth” surface of the screen. As a fire prevention measure, Winkler further instructed that a small, brick building be constructed at the rear of the theater to house the popcorn machine. Renovation work proceeded quickly, with the theater reopening on May 8, 1950. Fortunately, the tenants of the offices and apartment over the lobby of the theater had only smoke and water damage, and thus were able to stay after only minimal clean-up. Several years later, an itinerant painter came through to complete airbrushed paintings of cloud scenes in the new faux archways on the auditorium walls. 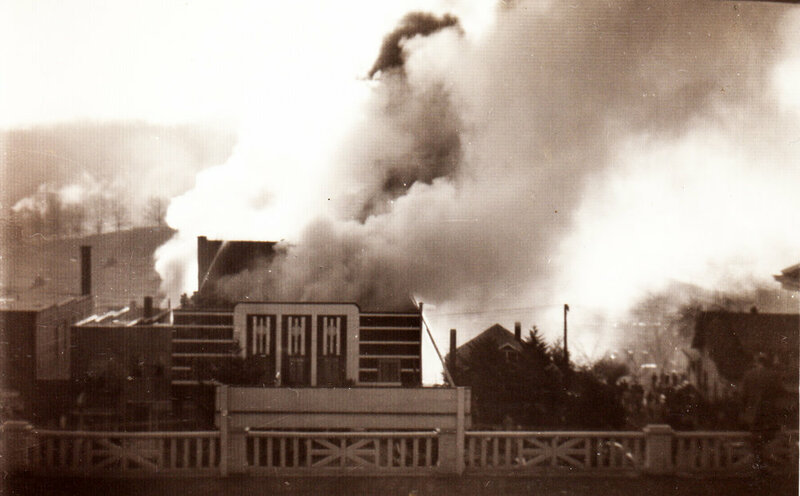 View of the 1950 Appalachian Theatre fire from the porch roof of the Daniel Boone Hotel. Image courtesy of Mark Hayes. The Appalachian Theatre following its 1950 post-fire renovation. Image courtesy of C. J. and Pauline Hayes. Despite the new, post-fire interior and efforts to carry on as before, in many ways, the Appalachian Theatre that reopened in May 1950 would never be the same again. The screen got larger and larger until, by 1954, with the addition of Cinemascope projection, the screen was so large that it expanded beyond the proscenium opening of the stage house and virtually ended live performances on the stage. Social changes in America were leaving their mark at the Appalachian, too. Originally a whites-only theater, by 1948 the Appalachian’s local manager, Robert Agle, was allowing black patrons to attend screenings. Seating throughout the 1950s was segregated, with black patrons relegated to the balcony, and the theater’s two small bathrooms on the balcony level—the only ones in the entire building—were reserved for white patrons only. By the early 1960s, however, national civil rights protests began to break down this segregation. Picketing at the Varsity and Carolina theaters in 1961, for instance, led to the non-violent integration of movie theaters in Chapel Hill, North Carolina, in early 1962. In some respects, the Appalachian Theatre was ahead of this social change. Agle Family tradition holds that Robert Agle came to the Appalachian the morning after news broke of the February 1960 lunch counter sit-ins at the Woolworth’s Department Store in Greensboro, NC, and announced that the theater would no longer enforce segregated seating. Title II of the Civil Rights Act of 1964 then brought to an official end the segregation of “any motion picture house, theater, concern hall, sports arena, stadium or other place of exhibition or entertainment” in the United States. National changes in the film business also had an impact on the Appalachian. In 1948, the most powerful studios—those who controlled the production and distribution of their movies, and also owned many of the most profitable theaters where these movies would be shown—were declared monopolies by the Supreme Court and forced to sell off their theater chains. More devastating for theater attendance in the years to follow was a new technology that altered the entertainment industry irrevocably: television. The post-war growth of suburbia and the concurrent rise of home entertainment moved populations away from downtown neighborhoods and offered families a new alternative to “a night out at the movies.” One statistic highlights how rapid this change took place: 1946 was Hollywood’s biggest year ever, with over 90 million people attending the movies on a weekly basis, but by 1956, the number was half that. The classical Hollywood studio system was in financial free fall. Despite these seismic changes in the film business, American movies and the Appalachian were far from finished. While the Pastime fell into disuse and was closed by the end of the decade, the Sky-Vu drive-in and the Appalachian moved successfully into the post-WWII period, programming movies that are today considered classics. During the 1950s and early 1960s, the Appalachian continued its commitment to the western genre—still outrageously popular with audiences—by screening such accomplished examples of the genre as High Noon (1952), Shane (1953), and The Man Who Shot Liberty Valance (1962). Other exemplary Hollywood films shown at the Appalachian during this period were the romantic Roman Holiday (1953), the melodramatic Written on the Wind (1956), and the musical Funny Face (1957). Alfred Hitchcock was represented by many of his best films, including Rear Window (1954) and Psycho (1960); Disney was a favorite too, both the animated films (Sleeping Beauty ) and live-action movies (Mary Poppins ). Two groups benefitted from this steady weakening of the major studios, however. The first was foreign film fans. After the blockbuster run of the Italian film Rome: Open City in Manhattan in 1946-7, independent distributors and exhibitors tested out foreign films in heartland theaters, and discovered a small but devoted audience for mature, and sometimes arty, international fare. This was true at the Appalachian, where foreign films entered the programming in the late 1940s and were especially popular in the 1960s and early 1970s. In 1965, for instance, films labeled “A.S.T.C. Classics” in newspaper ads—and aimed at students at Appalachian State Teacher’s College looking for adventurous motion pictures—included the French comedy Mr. Hulot’s Holiday (1953), the Italian neorealist Two Women (1960), and the British “kitchen sink” dramas Saturday Night and Sunday Morning (1960) and The Loneliness of the Long-Distance Runner (1962). The other beneficiaries of the decline of the major studios were companies that specialized in low-budget filmmaking for young audiences. The quintessential example is American International Pictures, which churned out cheap genre movies while exploiting trends in youth culture. A.I.P. made monster movies (Attack of the Crab Monsters , The Little Shop of Horrors ), horror films (the Edgar Allan Poe stories very loosely adapted to the screen by director Roger Corman), beach party movies (Beach Blanket Bingo , The Ghost in the Invisible Bikini ), biker dramas (The Wild Angels , The Born Losers ), and motion pictures about the hippie culture (The Trip , Gas-s-s-s ). Virtually all of A.I.P.’s films played at the Appalachian. New Hollywood blockbusters like Jaws (1975) and Star Wars (1977) brought big Hollywood studios like Universal and 20th Century-Fox back to profitability and prominence; foreign films and low-budget independent filmmaking survived, but as a much smaller segment of the American market. While the Appalachian Theatre never ran pornographic films, it’s still exciting to remember a time when Boone audiences could see movies like Belle de Jour (1967), Dracula Has Risen from the Grave (1968), and 200 Motels (1971) at the Appalachian, all of which would have been a bit on the racy side for a small mountain town like Boone. The Appalachian Theatre, circa 1970. Image from the Appalachian Theatre archives. The interior of the Appalachian Theatre as seen from the balcony, May 2013. Image courtesy of Eric Plaag. While the Appalachian Theatre was still profitable in the 1970s, the building’s owners were growing weary of being in the theater business. By 1975, the Statesville Theatre Corporation had also begun leasing the theaters it owned to a larger North Carolina theater chain, Essantee Theatres, Inc, of Charlotte. Since the Appalachian was not owned by the Sams family’s operation, it fell to the actual owners—Winkler and his wife Effie—to draw up a new lease agreement with Essantee Theatres, which was known to the public as the Stewart and Everett Theatres chain (“S” and “T” = “Essantee”). This lease arrangement continued until 1981, when Essantee bought the Appalachian Theatre property outright from the Winklers. Major renovations accompanied these changes in ownership, some with an eye toward making the theater more profitable. At some point prior to 1982, for example, concerns expressed by the Town of Boone about the safety of the prominent marquee prompted its removal from the façade in favor of a flat sign adhered to the front of the building. By February 1982, Essantee also enclosed the balcony, converted the theater to two screens, expanded the lobby into the retail space on the east side of the first floor, and changed the name to the Appalachian Twin. Carmike Cinemas then obtained the building as part of its 1986 purchase of the Essantee Theatres chain. Carmike in turn sold the Appalachian Theatre to a Florida developer in 2008, who stripped the building of nearly all of its remaining architectural finishes on both the exterior and interior in an effort to transform the building into a bar and performance venue. Shortly after this demolition work, the developer ran into financial difficulties, and work at the theater stopped. The Town of Boone then purchased the building in 2011 as part of that developer’s bankruptcy proceedings. With the assistance of the Downtown Boone Development Association, the Appalachian Theatre of the High Country, Inc. (ATHC)—a non-profit organization committed to recreating the theater’s former glory, preserving its history, and transforming the building into one of the High Country’s premier arts and culture venues—purchased the property in 2013 and began efforts to bring the Appalachian back to life. In early 2017, working with Clearscapes Architecture and VPC Builders, the ATHC completed its façade and marquee reconstruction that mimics the theater’s original exterior appearance. While efforts to restore the original structural glass of the façade were unsuccessful because structural glass is no longer manufactured and sufficient salvaged material could not be found, the new spandrel glass façade and replica marquee nevertheless faithfully represent the original appearance of the 1938 Appalachian Theatre. The next step will be the renovation of theater’s interior into a modern performance venue with an accompanying community room space, both of which will incorporate elements of the theater’s original Art Deco decor. This work is expected to begin in Spring 2018, with the theater slated to re-open in 2019.